The disadvantages associated with immigration put the children of immigrant families at risk for academic failure. This study investigates the efficacy of educational support provided by the Swedish preschool system to the children of the Turkish families who migrated to Sweden. In this study non-equivalent control group design was used. The sample of the study consists of a total of 45; 5 years old preschool children, 23 Swedish children and 22 Turkish children receiving native language support. During the research both groups continued attending regular public preschool program. Bracken Basic Concept Scale – Revised Form was used as a data collection tool. The results demonstrated that the Swedish preschool education programme was effective in supporting Swedish and Turkish children’s concept acquisition and school readiness. Nevertheless, the programme was not able to close the gap significantly between the Turkish and Swedish children’s concept acquisition and school readiness observed prior to program implementation. Becker, B., Klein, O., & Biedinger, N. (2013). The development of cognitive, language, and cultural skills from age 3 to 6: a comparison between children of Turkish origin and children of native-born German parents and the role of immigrant parents’ acculturation to the receiving society. American Educational Research Journal, 50(3):616-649. Behtoui, A. (2004). Unequal opportunities for young people with immigrant backgrounds in the Swedish labour market. Labour, 18(4): 633-660. Beiser, M.,Hou, F., Hyman, I. &Tousignant, M. (2002). Poverty, family process, and the mental health of immigrant children in Canada. American Journal of Public Health, 92(2):220-227. Bracken, B. A. (1984). Bracken basic concept scale examiner's manual. San Antonio, TX: Psychological Corporation. Bracken, B. A., Sabers, D. & Insko, W. (1987). Performance of black and white children on the bracken basic. Psychology in the Schools, 24(1): 22–27. Bracken, B.A. & Crawford, E. (2010). Basic concepts in early childhood educational standards: a 50-state review. Early Childhood Education Journal, 37:421–430. Cook, T. D., & Campbell, D. T. (1979). Quasi-experimentation: Design & Analysis issues for Field Settings. Boston, MA: Houghton Mifflin Company. De Feyter, J. J., & Winsler, A. (2009). The early developmental competencies and school readiness of low-income, immigrant children: Influences of generation, race/ethnicity, and national origins. Early Childhood Research Quarterly, 24(4):411-431. Dietz, J. (2010). Introduction to the special issue on employment discrimination against immigrants. Journal of Managerial Psychology, 25(2):104-112. Dotterer, A. M., Iruka, I. U., & Pungello, E. (2012), Parenting, race, and socioeconomic status: links to school readiness. Family Relations 61(4): 657–670. Fleer, M., & Raban, B. (2006). A Cultural-historical analysis of concept formation in early education settings: conceptual consciousness for the child or only the adult? European Early Childhood Education Research Journal 14(2):69-80. Fossati, F. (2011). The effect of integration and social democratic welfare states on immigrants’ educational attainment: a multilevel estimate. Journal of European Social Policy, 21(5):391-412. Fröhlich, L.P., Petermann, F., & Metz, D. (2013). Phonological awareness: factors of influence. European Early Childhood Education Research Journal, 21(1):5-22. Han, W.J., Lee. R., & Waldfogel, J. (2012). School readiness among children of immigrants in the US: evidence from a large national birth cohort study. Children and Youth Services Review, 34(4):771-782. Heath, A. F., Rothon, C., & Kilpi, E. (2008). The second generation in Western Europe: education, unemployment, and occupational attainment. Annual Review of Sociology, 34: 211-235. Jonsson, J.O., & Rudolphi, F. (2011). Weak performance-strong determination: school achievement and educational choice among children of immigrants in Sweden. European Sociological Review, 27 (4): 487-508. Karoly, L. A., & Gonzalez G. C. (2011).Early care and education for children in immigrant families. Journal of the Future of Children, 21(1):71-101. Knocke, W. (2000).Integration or segregation? Immigrant populations facing the labour market in Sweden. Economic and Industrial Democracy, 21(3):361-380. Leseman, P.P.M., & Tuijl, C. V. (2001) Home support for bilingual development of Turkish 4–6-year-old immigrant children in the Netherlands: efficacy of a home-based educational programme, Journal of Multilingual and Multicultural Development, 22(4):309-324. Liebkind, K., Jasinskaja-Lahti, I., & Solheim, E. (2004). Cultural identity, perceived discrimination, and parental support as determinants of immigrants’ school adjustments: Vietnamese youth in Finland. Journal of Adolescent Research, 19(6):635-656. Lindberg, I. (2007). Multilingual Education: a Swedish Perspective. In M. Carlson, A. Rabo and F. Gök (Eds). Education in ‘Multicultural’ Societies – Turkish and Swedish Perspectives (pp. 71-90). Stockholm: Swedish Research Institute in Istanbul (Vol.18). Loeb, S., Fuller, B., Kagan, S. L., & Carrol, B. (2004). Child care in poor communities: early learning effects of type, quality, and stability. Child Development, 75(1):47–65. Magnuson, K., Lahaie, C., & Waldfogel, J. (2006). Preschool and school readiness of children of immigrants. Social Science Quarterly, 87(5):1241–1262. Maneva, B. (2004): 'Maman, je suispolyglotte!’: A Case study of multilingual language acquisition from 0 to 5 years. International Journal of Multilingualism, 1(2):109-122. Matthews, H., & Even, D. (2010). Early education programs and children of immigrants: learning each other’s language. Washington, DC: The Urban Institute. McCartney, K., Dearing, E., Taylor, B. A., & Bub, K. L. (2007). Quality child care supports the achievement of low-income children: direct and indirect pathways tthrough caregiving and the home environment. Journal of Applied Developmental Psychology, 28(5–6):411-426. Mistry, R. S., Biesanz, J. C., Chien, N., Howes, C., & Benner, A. D. (2008). Socioeconomic status, parental investments, and the cognitive and behavioural outcomes of low-income children from immigrant and native households. Early Childhood Research Quarterly, 23(2):193-212. National Agency for Education (2006). Curriculum for the Preschool Lpfö 98.Stockholm: Fritzes. Otterup, T. (2012a). Multilingual and multicultural schools in Sweden -rhetoric and reality. In E., Winters-Ohle, B. Seipp, B. Ralle, (Eds), Lehrer fürschülermitmigrationsgeschichte - sprachlichekompetenzimkontextinternationalerkonzepte der lehrerbildung (pp. 175-182) Münster: Waxmann. Otterup, T. (2012b). Multilingual development and teacher training in a multicultural society - the Swedish example. In E., Winters-Ohle, B. Seipp, B. Ralle, (Eds), Lehrer für Schülermit Migrationsgeschichte – Sprachliche Kompetenzim Kontextinternationaler Konzepte der Lehrerbildung (pp. 164-172) Münster: Waxmann. Passel, J. S. (2011). Demography of immigrant youth: past, present, and future. The Future of Children, 21(1):19-41. Pásztor, A. (2008). The Children of guest workers: Comparative analysis of scholastic achievement of pupils of Turkish origin throughout Europe. Intercultural Education, 19(5): 407-419. Rao, N., Sun, J., Zhou, J., & Zhang, L. (2012). Early achievement in rural china: the role of preschool experience. Early Childhood Research Quarterly, 27(1):66-76. Rindermann, H., &Ceci, S.J. (2009).Educational Policy and country outcomes in international cognitive competence studies. Perspectives on Psychological Science, 4(6):551-568. Rumbaut, R. G. (1997). Ties that bind: immigration and immigrant families in United States, in A.Booth, A.C. Crouter, N. Landale (Eds.) Immigration and the family: research and policy on US immigrants, (pp. 3-46), New Jersey: Lawrence Erlbaum Associates. Safi, M. (2010). Immigrants’ Life Satisfaction in Europe: Between Assimilation and Discrimination. European Sociological Review, 26 (2):159-176. Sheridan, S., & Pramling Samuelsson, I. (2001). Children’s conceptions of participation and influence in preschool: A perspective on pedagogical quality. Contemporary Issues in Early Childhood, 2(2):169-194. Shields, M.K., & Behrmen, R. E. (2004). Children of immigrant families: analysis and recommendations. The Future of Children, 14(2):4-15. Skolverket (2008a). With another mother tongue–students in compulsory school and the organization of teaching and learning, Stockholm: National Agency for Education Report 321. Skolverket (2008b). Ten years after the preschool reform: A national evaluation of the Swedish preschool. Stockholm: National Agency for Education Report 318. Stebbish, M.S., & McIntosh, D.E. (1996).Decision-Making utility of the bracken basic concept scale in identifying at-risk pre-schoolers. School Psychology International, 17 (3):293-303. Stroud, C. (2002).Towards a policy for bilingual education in developing countries. Stockholm: Swedish International Development Cooperation Agency (SIDA) Department for Democracy and Social Development, DESO Education Division, New Education Division Documents No. 10. Taguma, M., Kim, M., Brink, S., & Telteman, J. (2010).OECD reviews of migrant education Sweden. Paris: OECD. Tienda, M., & Haskins, R. (2011). Immigrant children: introducing the issue. The Future of Children, 21(1):3-18. Toran, M., & Temel, F.Z. (2012). Examination of Turkish preschool curriculum’s effect on children’s concept acquisition. Procedia-Social and Behavior Sciences Journal 47:594-599. Üstün, E., & Akman, B. (2003). Üç yaş grubu çocuklarda kavram gelişimi. Hacettepe Üniversitesi Eğitim Fakültesi Dergisi, 24:137-141. Vosniadou, S., Pagondiotis, C., & Deliyianni, M. (2005).From the pragmatics of classification systems to the metaphysics of concepts. The Journal of the Learning Sciences, 14(1):115–125. Warren, A. R. (2013). Mother tongue tuition in Sweden - curriculum analysis and classroom experience. International Electronic Journal of Elementary Education, 6(1):95-116. Wilson, P. (2004). A preliminary ınvestigation of an early ıntervention program: examining the ıntervention effectiveness of the bracken concept development program and the bracken basic concept scale-revised with head start students. Psychology in the Schools, 41(3):301–311. Wilson, S.J., Dickinson, D.K., & Rowe, D.W. (2013). Impact of an early reading first program on the language and literacy achievement of children from diverse language backgrounds. Early Childhood Research Quarterly, 28(3):578-592. Yağmur, K. (2007). İki dilli çocukların dil becerilerinin ölçümü ve eşik kuramı. Dil Dergisi 135:60-76. Yazıcı, Z., Genç İlter, B., & Glover, P. (2010). How bilingual is bilingual? Mother tongue proficiency and learning through a second language. International Journal of Early Years Education, 18(3):259-268. ISNAD Toran, Mehmet . "DOES PRESCHOOL EDUCATION HELP IMMIGRANT CHILDREN REACH THEIR NATIVE PEERS’ ACADEMIC LEVELS? : A CASE OF TURKISH IMMIGRANT CHILDREN IN SWEDEN". 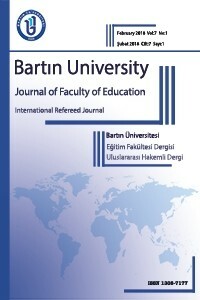 Bartın University Journal of Faculty of Education 5 / 3 (October 2016): 652-668.